When I was a student I would eat pretty much anything. A particular favourite meal was mayonnaise and sweetcorn sandwiches. I remember them being absolutely amazing at the time, but probably not something I plan to revisit now. As I’ve got older I’ve got more careful about the quality of the food that I put into my body. I can’t promise that I’m not partial to the occasional junk food spree, but I’m very aware of how much better I feel when I’m eating quality food. Recently the Organic Trade Board got in touch with me about their Feed Your Happy campaign. They asked me to create a Christmas recipe that makes me happy using organic produce, and I immediately knew what recipe I wanted to share. 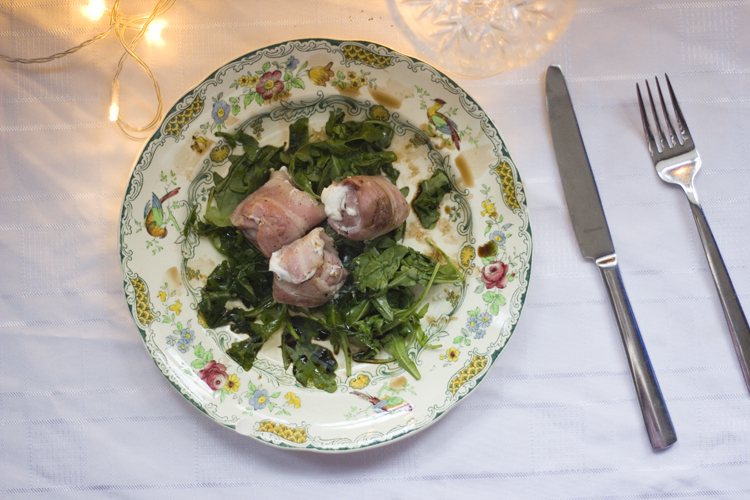 This recipe for Goats cheese and bacon parcels is one I’ve been making for about 20 years. I first made it as a Christmas starter for a family Christmas when I was a teenager. It was my first steps into grown up cooking. Helping prepare food for my family on Christmas day and seeing everyone enjoy it was a great feeling, and I can still remember how proud I felt preparing it and feeling like I’d contributed to Christmas dinner! I don’t think I was using organic ingredients 20 years ago, but this recipe is the perfect example of something where choosing organic is a great choice. Animals that are fed on feed containing antibiotics and pesticides will store that and when you eat it you’ll be consuming those chemicals. This is even more concentrated in dairy products like Goats cheese, so it makes sense to choose organic where you can, and especially at Christmas when you want to choose the best quality ingredients. If you want to search out where to buy organic ingredients near you, then the Organic Collective Christmas Market is a great place to start. This is a really easy recipe, or otherwise I wouldn’t have been cooking it at 14, but it’s packed with flavour and delicious, gooey, cheesy, yumminess. 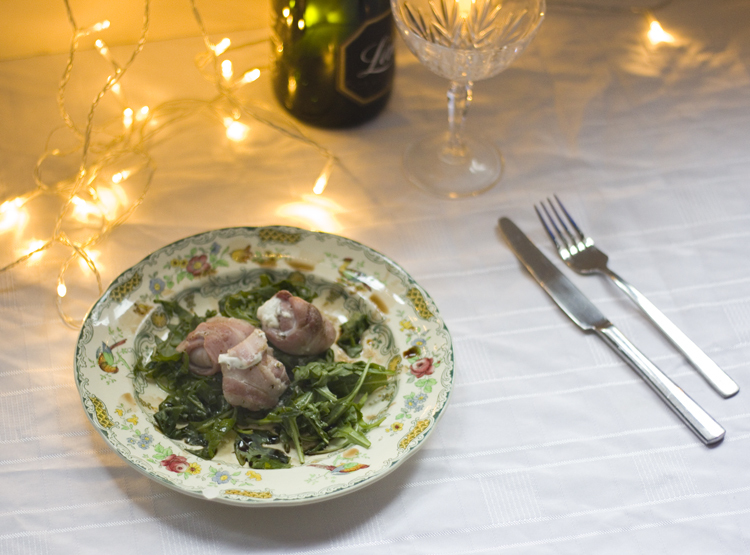 For a more festive touch, it’s lovely served with a dollop of cranberry sauce. Divide the soft goats cheese into 6 pieces and roll into small balls. Sprinkle the ground black pepper on a plate and then roll the goats cheese balls in it until they are fully coated. Wrap each piece of cheese in a rasher of streaky bacon. Be careful to leave no gaps as the cheese will melt and escape! Put the parcels in the fridge to chill. This will cool the cheese so it melts less when cooking. Pre-heat the grill to medium high heat. 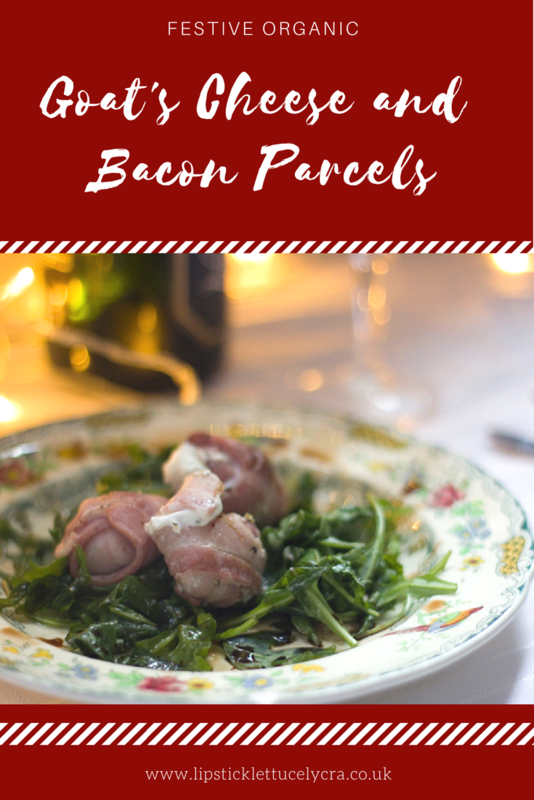 Grill the parcels until the bacon is cooked, but not crispy. Turn them once during cooking, moving them too much will cause escaping cheese! 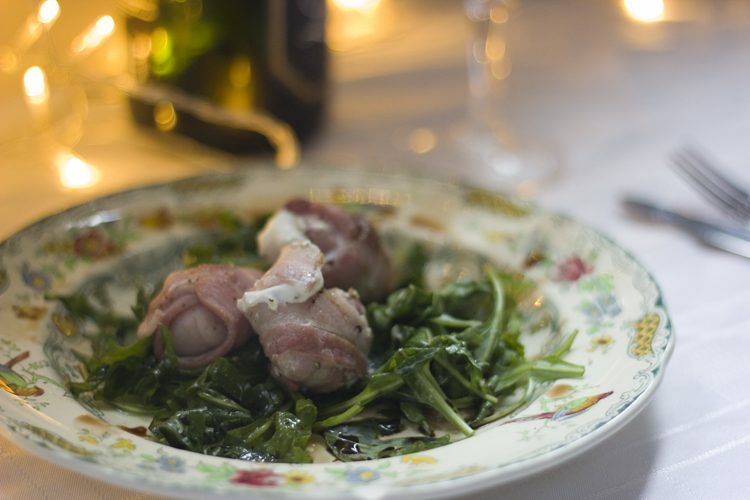 Serve on a bed of rocket dressed with balsamic vinegar and olive oil.